Viking Splash Tours is a truly unique experience on land and water, taking in the sights of Dublin during a fun-filled and engaging guided city tour. Their authentic World War II amphibious vehicles, the Dukw, take you from land to water and back again, offering city vistas not available on other Dublin tours. Combining all of this with an imaginative and exciting Viking themed tour delivered by humorous and informative Viking driver-guides you will experience an original, enjoyable and informative experience that appeals to young and old alike. First scheduled tour departs at 10am and with the final tour departing as late as 5.30pm - tour times vary daily and may be booked out so please make sure to call in advance to check times or make a reservation. Please note that tour times during Winter are much shorter with last tour leaving at 2.30 or 3pm and there may be an extended winter break. Tours run roughly every 30 minutes during peak times and every 90 minutes off peak. 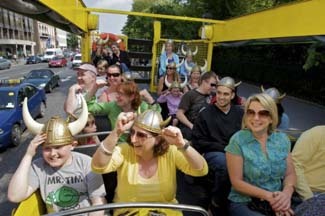 Viking Splash Tours bus stop on Stephens Green North located just behind the taxi rank and water fountain.